Volunteers desperately needed as our Founder has been caring 24/7 for her Elderly father now for 13 months straight. Please won't anyone contact companies around country for donations of great things under our 501c3 and sponsorship of soldier's packages at $10.90 each. FYI: SFC G................ I'll let her know to get in touch with you. SSG T. filled up her Expedition with boxes of Royal Robbins, Burton Snowboard and other brand new Sample Clothes for the families, and tons of donated hand made quilts and other items for the soldiers and their families waiting at the unit for you guys. And Sharina, one of the FRG wives came with her mini van and we filled it with the rest of the items. They think Janet must have brought the 150 long sleeved wicking Moreno wool baseliner tops from Ice Breakers, New Zealand to Vegas to give to you guys when you deployed. I hope so. That was around $15,000 worth of clothing donated. I invited SSG T... and the W... to the Outdoor Retailer next January and you of course to collect as much great latest outdoor gear we can for the military as we can. Our Hero Teacher Sherese for her 5thyear in a row collected 4 large flat rate boxes stuffed full of 1000s of cards from Caches Valley/Logan Schools. Our wonderful Mary Kay Volunteer donated the great women’s gift bags, and so many more made beautiful things like the New York Young Womens group that made 10 gorgeous hand quilted Christmas Tree Fabric Card blankets. 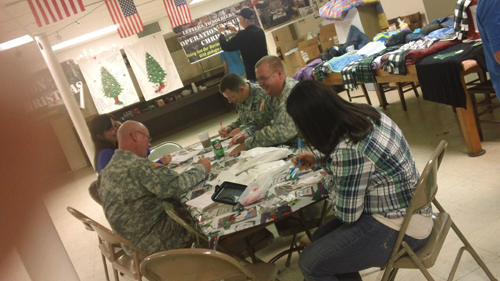 The commanders came, Col , Master SGT, and others and told us how much the care packages from home mean to them. Cindy of the museum all by her self made to pots of potatoe soup to put in rolls, Chick Fil A of American Fork owner donated 2 platters of the tallest richest Chocolate chip cookies everyone loved. The American Legion Post 19 two couples who are also Patriot Guard Riders and want to come to the airport to welcome you guys home and help me and SSG T. put up 30 Welcome Home Banners made by the schools. We will have to have the biggest Welcome Home party next year, and I am also going to ask my friend Steve Watts if Talon’s Cove golf course and country clubhouse overlooking Utah Lake from Saratoga Springs will donate the venue of rhe Christmas Party, and get one of the restaurants to cater that or the Welcome Home party which one of the soldiers said "a band to dance to would be great” so I will ask all the entertainers that have volunteered graciously in the past to come welcome you guys home with their great songs. 2012 is under way with OPERATION ENSURING CHRISTMAS VI. 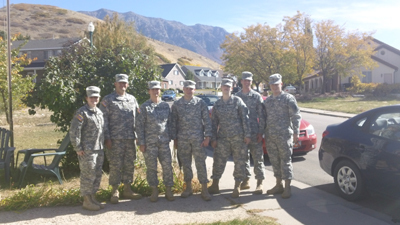 Volunteers are needed for calling companies for Grants, Donated items and volunteers for Packaging Day in October.
. We need volunteers to contact schools to make the cards/banners for the soldiers and pick them up for us around Utah. WE need volunteers to help make care packages for two other units. We wish to send our love and prayers to our wonderful friend "SANTA" that has come to visit the children of our military families every year but won't be able to make it this year. We love you SANTA. It is this Saturday Oct. 20th 6pm to 9pm Volunteers and donations for care package postage needed!!! 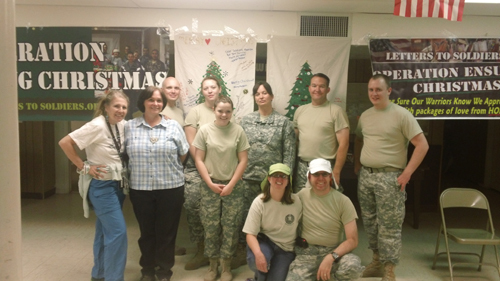 Thank you Cindy and staff, Angela FRL of 405th, Sherese our #1 hero teacher that gathers 1000s of cards every year, and others who have made beautiful things possible for the care packages to our Utah Soldiers this year. 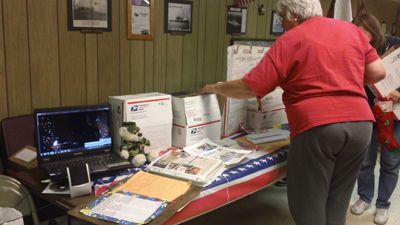 Each year care packages are sent out to the deployed soldiers by Letters to Soldiers. Below is a list of items we are collecting. • Clothes and Accessories: NEW IF POSSIBLE- sweatshirts, t-shirts, gloves, scarves, baseball caps and beanie caps, running shoes for soldiers, balls/gear for humanitarian efforts, games, sewn, knitted or handmade clothing, quilts & blankets. • Personal Hygiene/Nutrition: waterless shampoo/conditioner, foot powder, shaving cream, wipes, supplements, toothbrushes, waterless soap, pain relief creams, lotion, shatter proof sunglasses, and sunscreen. Women's perfume samples (no glass containers), make up, women's fun personal care products to help them feel feminine, quality personal care products like Tahitian Noni, Nature's Sunshine, we need more Vitamins and personal care products donated by companies. · Miscellaneous Items for the soldiers and their families: patrioticpillow cases, sheets, flags, toys for kids, posters, gift cards, handmade Christmas stockings, and small Christmas trees and decorations to fit in a USPS Flatrate box, great paperback books or ebooks we can email them to pass around, positive motivating dvds, ... For their families sacrificing so much while daddy or mommy is gone, we would love to have donations of new toys, baby items, clothes, shoes, sports equipment, gift certificates, free services LIKE: carpet cleaning, landscaping, handyman, plumbing, electricians, babysitting, mechanic, motel/hotel free stays, concerts, trips and other needs for the family. 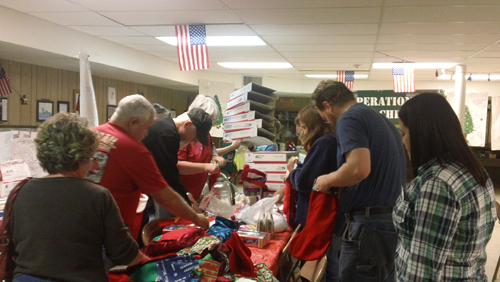 · One of the most important donations is money to ship donated items to soldiers. 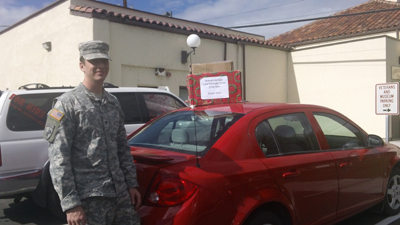 · By making a donation as small as $10.50, you can provide one soldier with a flat rate box full of things from home. Volunteers to help make care packages, Christmas Video Wishes with Santa, and Christmas Wish Banners needed at the Museum. Date to be announced. Come be part of a wonderful event to Thank Those who sacrifice so much for us. Thank you Logan, Utah Schools for only Utah cards this year. Volunteers needed for calling companies for Grants, Donated items and hosting/volunteers for Packaging Day in October. Looking for a company to host and sponsor Letters to Soldiers Annual Golf Tournament for their employees. We will also sent packages for their Valentine's Day, July 4th Cards from Schools all over US. 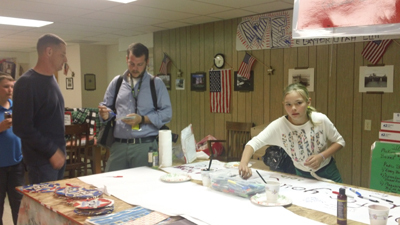 We need volunteers to contact schools to make the cards/banners for the soldiers and pick them up for us around Utah. WE need volunteers to help make care packages for two other units. Thank you FRG Janet, Suzanne and husbands of 405th CA for picking up two truck loads of boxes of hand made, collected donated items like 150 plus IceBreakers longsleeved Baseliner Shirts, and items we purchased for the 150 soldiers of the 405th CA in Afghanistan for their care packages this year. We hope to have more volunteers make home made treats, and get more cards and letters from schools for those packages. 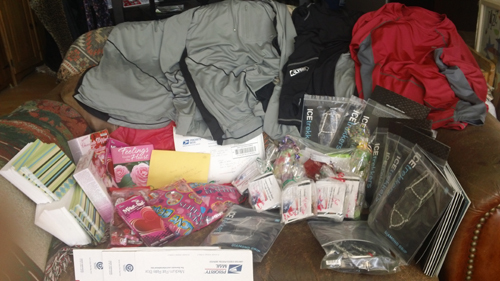 HAPPY VALENTINE'S DAY PACKAGES HAVE BEEN MAILED AND HERE IS ONE EXAMPLE thanks to KLymit and ICEtrekers, Mary KAy gift bags for two lady soldiers and 6 team leaders thanks to Carol Walden, letters for 150 soldiers from West Jordan school, Valentine's candies, cards, treats we bought, and more. "Thank you for all your efforts in providing great gear to our Men and Women in uniform. Budgets for donations are tight but I�ve copied in L... to see if there might be anything we can do here." SPONSOR ONE SOLDIER FOR ONLY $10 TO GET A CARE PACKAGE THIS YEAR LIKE THIS PLEASE!